“In the evening of August 4, 1689, the night of the Lachine massacre, a violent rainstorm hovered above the Saint Lawrence and the Island of Montréal. Lightning flashed repeatedly across the sky and deafening thunder resounded above the seventy-seven houses of the community of Lachine. “As the Canadiens slept in their isolated farms, fifteen hundred Iroquois stepped ashore, undetected by the sentries who had sought shelter against the fierce storm. Hidden by the night, warriors fanned out in small bands and readied themselves to attack isolated farmhouses. “They lurked on the edges of the woods, away from the dogs who might have given warning. These men dressed only in loincloths, their faces painted in grotesque shapes meant to frighten their victims, waited for the light of dawn to pillage the community. “As day broke, horrible war cries yanked the Canadiens upriver in Lachine from their sleep. Men and women, knowing all too well what the cries meant, jumped out of bed and rushed for the muskets they always kept loaded against such a time. “Already, their doors were being hacked down by tomahawks. 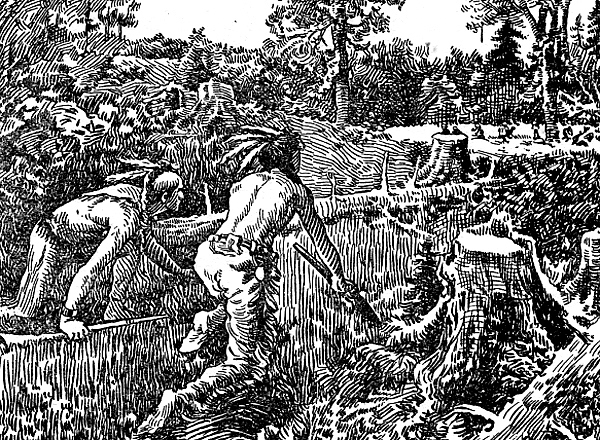 The habitants were able to defend themselves for a short while, but it was only briefly — the number of Iroquois pitted against them was too large. Soon, the grizzly warriors had broken down doors and were charging into the houses and axing their occupants. Blood flowed. 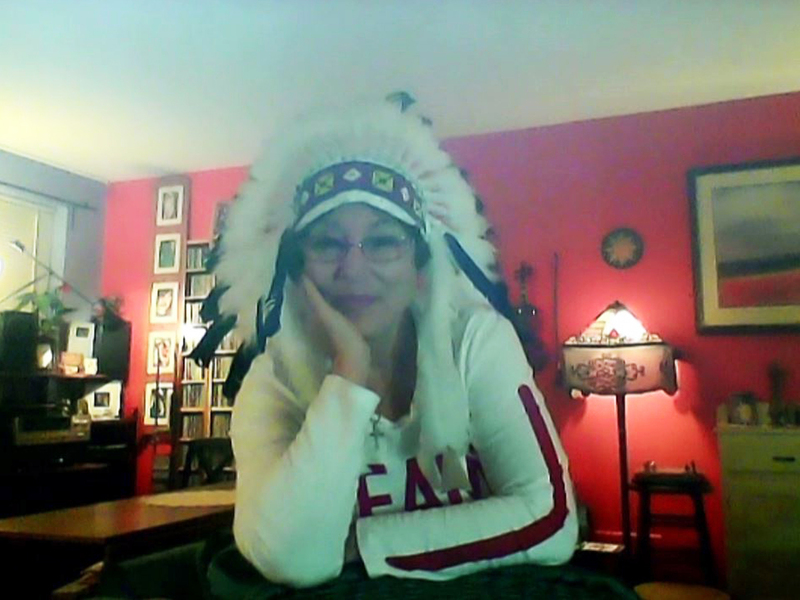 “But, by no means did the Iroquois want to kill all the residents. No, they seized some Canadiens, by far less fortunate than those who had been murdered immediately in their homes, to take as prisoners. Later, these luckless men and women would provide the bands of Iroquois with some entertainment. “Soon, having been pillaged of goods the Indians desired — especially the alcohol — much of Lachine was in flames. From the forts around Montréal, soldiers and the few Lachine colonists who had escaped could sometimes see the Iroquois as they continued to have free run of Montréal Island. The warriors stayed on the island for several days, ransacking, burning, killing. “In the nights that ensued, the colonists saw the bonfires of the Iroquois. These must not have been easy nights. Their husbands or wives or friends were being tortured. Some were burned slowly on a post set in a circle of faggots, awaiting a slow death that could be days in the coming; others were being eaten bit by bit, as parts of their flesh were hacked off their bodies and shared among their captors. 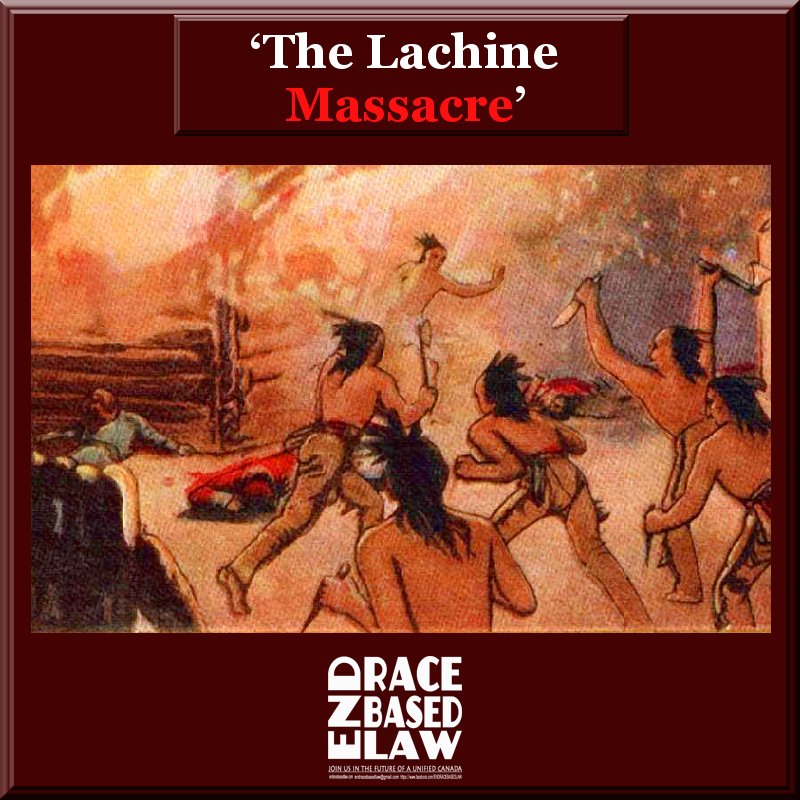 “As a result of the Lachine massacre, the settlement was almost entirely destroyed — its people gone, and fifty-six of the seventy-seven houses destroyed. As survivors walked around the land that had once been their farms, they found guns and knives the Indians had left behind. Many of these were of English manufacture. “On the night of August 4, 1689, a violent summer hailstorm swept across Lake St. Louis. As the householders got up to make sure windows were closed, they heard the screeching war cry of the Iroquois rising over the noise of thunder and hail. Within minutes, swarms of naked Iroquois, armed to the teeth, came running down the lane, their faces smeared with war-paint. There were 1,500 of them, taking advantage of the storm to cross the lake unseen. “…in May 1689, France and England declare war. In North America, the English of New York are first to hear the news — and immediately tell their Iroquois allies. “The Iroquois have been rivals of New France for much of the last 80 years. They consider the French system of alliances a potent threat to their security and their territory. “ In New France, no one knows that war has been declared. Most Canadians still live in unfortified villages — like Lachine, near Montreal,with its 375 habitants. 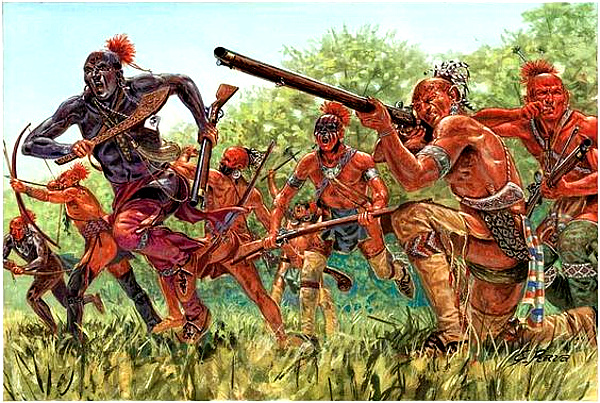 “At dawn on August 5, 1689, 1,500 Iroquois warriors attacked. Men, women, and children — no one was spared. André Michel, his wife Françoise Nadereau, their daughters Gertrude, Andrée and Petronille were all killed. 24 colonists in total were killed, more than 70 were taken prisoner, and 56 of the 77 houses were razed. “Later, a few prisoners managed to escape, and some were released in prisoner exchanges. – Vincent Aly dit Larosse, son of Mery and Louise Bouton. He was a former member of the Carignan Regiment. His wife, Marie Delphin Perrin, also perished but seven of their children managed to escape. – Noel Charmois dit Deplesses, husband of Marguerite Delorme, he was found burned in his house. – Andre Danis, his body was found with Noel Charmois, burned. – Jean Fagueret dit Petitbois. He was a soldier of the Carignan Regiment, his remains were found and buried 28 October 1694 on the property of Rene Chartier. There was evidence that the flesh had been eaten. – Perinne Filastreau, daughter of Rene and Jeanne Herault, she was found decapitated. – Indian Panis… she was found decapitated. – Marie Delphine Perrin, married to Vincent Alix dit LaRosse, she and her husband were burned in their cabin with their children. “On the night of 19 November 1689, a war party of 150 warriors of the ‘Iroquois Confederacy’ attacked the farming community of Lachenaie, New France seventeen miles north of Montreal. The attack resulted in the deaths of many French settlers including my seventh great-grandfather Leonard Ethier. “Leonard Ethier arrived from France in the small trading village of Ville-Marie, New France (today’s Montreal) in 1670. Elisabeth Godillon arrived in Ville-Marie in a separate ship on July 31 the same year. After a short courtship, the couple was married less than two months later in a small wood chapel name Notre-Dame (Our Lady) on September 22. After several years, Leonard obtained a land concession of six acres in Lachenaie, which he began to farm. 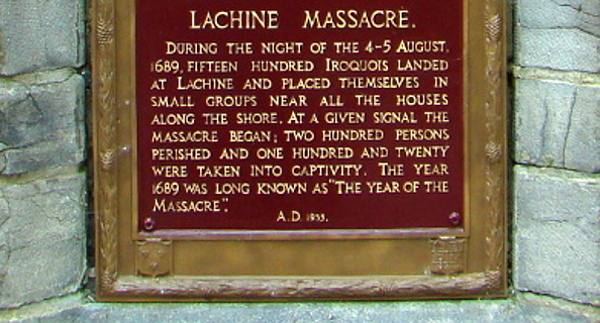 “In the ensuing years, there were more Iroquois raids on Lachenaie. They attacked again in May 1691 under the same Chief, burning barns and houses and vandalizing crops. To make matters worse, 1691 was also a year of famine. Chief Chaudiere Noire again attacked the settlement in July, 1692. Several colonists died during these raids. “Of all the North American Indian tribes, the seventeenth-century Iroquois are the most renowned for their cruelty towards other human beings. Scholars know that they ruthlessly tortured war prisoners and that they were cannibals; in the Algonquin tongue, the word Mohawk actually means “flesh-eater”. “There is even a story that the Indians in neighboring Iroquois territory would flee their homes upon sight of just a small band of Mohawks. Ironically, the Iroquois were not alone in these practices. 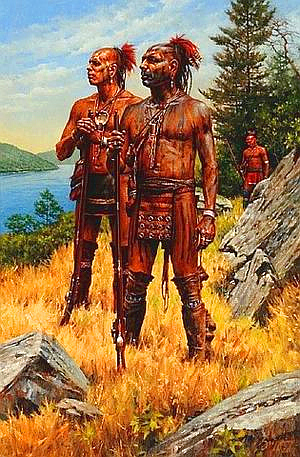 “The Iroquois were the dominant force in northeastern America until the Europeans came to the New World. Five smaller nations made up the ‘League of the Iroquois’: they were the Onondaga, Mohawk, Oneida, Cayuga, and Seneca tribes. The legendary Hiawatha joined these five tribes together into a single powerful confederation, after fierce blood feuds threatened to destroy all five nations. “It is also important to establish that the practices of the Iroquois were more than the exaggeration and hearsay of excitable Frenchmen. The Iroquois surely performed torture upon war captives; many European settlers viewed first-hand the mutilated body-parts of war captives. However, there has been some doubt in the current century that cannibalism was really practiced by the Iroquois. “The death of family members had a profound psychological effect upon the Iroquois; thus, they required strong measures to relieve themselves of sadness. Essentially, they felt that they needed restitution in some form or another for the dead relative. “Grieving matriarchs petitioned the tribe’s warriors to retrieve captives from an offending tribe. The Iroquois warriors then established a raid solely to gather captives; scholars call this practice “mourning-wars”. “According to Anthony Wallace, the grieving Iroquois could find restitution in one of three ways. The first was for a warrior to bring back the scalp of an Indian from the killer’s tribe and to present it to the grieving person. Though the scalp represented a captive, live prisoners were preferred. “The other two options involved a live captive: the Iroquois either vengefully tortured the prisoner to death or adopted him or her into the tribe. Since the Iroquois were a matriarchal society, the mourning woman would ultimately decide the fate of those captives that were brought to the village, mostly based upon the amount of grief that she felt for her dead relation. “Reverend Father Barthelemy Vimont presented a harrowing example of Iroquois torture that occurred in 1642 in “The Jesuit Relations and Allied Documents”. In this account, he told of an Iroquois war band that captured a small group of Algonquin, and himself. “Immediately, the Iroquois cut off a few fingers from each captive, using fish scales. The Iroquois intended to take the captives to their village. On the way, one Algonquin woman, realizing what her fate would be, ran into a icy river and drowned herself rather than face the impending torture. Once they had arrived at their captors’ village, the Iroquois made their prisoners sing and dance upon a scaffold. Vimont’s companion, a converted Algonquin named Adrian, wouldn’t sing in the Iroquois’ language, and they slit his fingers lengthwise to cause him intense pain. Next, they cleared the scaffold except for one Algonquin named Awessinipin, and they began burning his body with brands. The Iroquois forced an Algonquin woman to take a torch and burn Awessinipin and then killed her when she finally complied. Throughout this entire ordeal, the Algonquin man showed no pain. They continued this torture throughout the night, building to a fervor, finally ending at sunrise by cutting his scalp open, forcing sand into the wound, and dragging his mutilated body around the camp. When they had finished, the Iroquois carved up and ate parts of his body. “The Jesuit Relations”, “The Explorations of Radisson”, and “Narrative of the Life of Mrs. Mary Jemison” offer other detailed descriptions of Iroquois atrocities, but generally the torture followed the same pattern. First, the victorious Iroquois warriors would mangle the prisoners’ hands; they did this by pulling out the captives’ fingernails and/or cutting off some of their fingers. The victors usually subjected the prisoners to a heavy beating at the same time. “There are definitely reasons behind this torture that do not extend into metaphysical domains… The Iroquois would execute without ceremony those captives who fell and did not get up, which indicates disdain for mental and physical weakness. Indeed, the Iroquois expected even those captives who underwent subsequent lethal torture to stand strong and not cry out—the warriors would disgustedly dispatch a captive who lost his composure. “As the night went by and the prisoner remained silent, the entire tribe would become more and more frenzied, until the sun came up and the prisoner was killed. Thus, it seems that torturing captives to death was a ritualized act of vengeance that was truly fulfilled only when its objective (making the victim respond to the torture) failed! “The warriors were not the only ones who conducted the torture, however; the women and children of the village had just as much of an active role as the men did. While the captives were perched upon the scaffold, the children of the tribe would jab at the prisoner’s feet with knives. In addition to this, every person in the village took turns with the burning torches during the night ritual. In fact, the rest of the tribe would scorn anyone who did not partake in the torture as a weak and lazy individual. “The Iroquois usually chose the captives who were adopted during their torture, specifically after they had run the gantlet or were suffering the humiliation stage. Pierre Radisson exemplifies this when his adopted Iroquois parents drag him by the hair from the gantlet in his second captivity. “At first, the practice of torturing a potential family member seems extraordinarily odd, but the Iroquois had a reason for this, too. When the Iroquois adopted a captive, the torture acted as a symbolic end to the captive’s old life. In theory, the captive rejoiced that his tormentors had saved his or her life and was happy to join the Iroquois. In practice, this did not always guarantee the adopted member’s loyalty. “This is also demonstrated by Pierre Radisson when he was captured twice; though he even came to empathize with his new parents after his second capture, he still chose to escape when he had the opportunity. Yet, a significant number of accounts do indicate that many captives, nearly all from other Native American tribes, did elect to stay with their new Iroquois families. “Though modern Americans do not associate other tribes with the practice of ‘mourning wars’, they performed the same methods of torture that the Iroquois did. These accounts are much less frequent than descriptions of Iroquois torture; nevertheless, they do exist and are no less ruthless in nature. “Samuel de Champlain’s notes contain accounts of the Algonquins, Montagnais, and Etechemins as the aggressors. After they captured a handful of Iroquois in battle, these “friendly” tribes proceeded to torture the captives to death. They burned the body of one captive Iroquois, then poured water on him in cycles so that his flesh would fall off his body. When they had finally killed him and threw his innards into the river, the Indians told Champlain that this act was done in vengeance for their own mutilated tribesmen. “As previously mentioned, the Iroquois were not alone in this practice, as various accounts describe the Winnebagos, Huron, and other French-sympathizing Indians partaking in feasts of human flesh. In the aforementioned Champlain account, the Algonquins, Montagnais, and Etechemins did not actually eat the Iroquois captive’s flesh but rather, forced the other captives to eat his heart. “The Aztecs are a perhaps the best-known nation of people besides the Iroquois who possessed cannibalistic practices. High priests ritually sacrificed victims to their god Uitzilopochtli by removing the captive’s heart. When they had finished with the body, they threw it down the steps of the sacred pyramid, where it was taken and eaten by the citizens. “Despite the association with religion, contemporary anthropologists have come to the conclusion that the act of cannibalism had less to do with the sacrificial ceremony and more with improper nutrition. Their practice results from a protein-deficient diet in which human beings are the only real source of meat. “While there are instances of Native Americans resorting to cannibalism in very hard times, these northeastern Indians generally had no lack of meat and since their cannibalism was limited to war prisoners, this reason is unlikely. This is not to say that cannibalism was never practiced for food by the Iroquois or their neighbors, just that it was definitely not the primary practice in the present context. “Bringing up the Aztecs, however, leads to another worthy point of examination: that the practice of cannibalism might have been religious in nature. There was indeed a single god of war, sun, and fire, who was present by various names in many of the northeastern Indian tribes. His name was ‘Aireskoi’ and he required sacrifice and consumption of human flesh in his honor. “There are some further links between him and the atrocities the Iroquois committed. In a particular act of torture recounted by a Jesuit, Father Brebeuf, the Iroquois set eleven bonfires around their captive and tortured him until sunrise, when Aireskoi could look upon their work. Though not usually referred to in such religious terms, the practice of torture did last the entire night in most accounts. The bulk of Iroquois lethal torture consisted of the use of flame upon the captive’s body, which is also indicative of Aireskoi’s domain (of course, fire was also excruciatingly painful, and non-lethal in the way the Iroquois used it). Though these points begin to make a case that religious worship was the cause of northeastern Indian atrocities, there are no other accounts besides this one, written by a priest, that claim religious motivation for the cannibalism. Iroquois cannibalism generally occupies part of a torture routine; however, it is more akin to “brunch” than a Thanksgiving dinner. “Another religious figure that has cannibalistic associations is one of the creators of the earth, the ‘Good Twin’. While the Iroquois creation myth is too long and involved to be mentioned in detail here, what bears importance to this paper is that the ‘Bad Twin’ killed the ‘Sky-Mother’ when the two were born and blamed it on the Good Twin, who was expelled from Family. The Good Twin would wander the earth and help man when he could. “The Iroquois also hold the belief that to eat a thing is to gain its power. This follows naturally…because even in death, the body’s remains keep at least part of its soul. This is most apparent in the everyday diet of the Native Americans. For example, the people of the river villages Akwesasne and Kahnawake were known to be excellent swimmers, and this was reputedly caused by the large amount of fish in their diets. A hunter’s talent was also supposed to depend upon the amount of game that he consumed (which only makes sense because the better hunter would be able to acquire, and thus consume, more game). “With these two premises, it follows that devouring the flesh of a great warrior would transfer his prowess into the one doing the eating. There is no mention that the Iroquois ate the flesh of those captives who did not die ceremoniously; perhaps these “weak” prisoners were considered unworthy to be eaten. There is also no mention that the Iroquois ate the flesh of anyone who was not tortured to death — those people who did not have had a chance to prove themselves. “Yet, like the previous spiritual explanation, only one account exists that establishes a link between great warriors and the humans they eat. A Huron Indian who escaped Iroquois captivity described how a Jesuit was killed and eaten. The priest had endured great pain before his death, and the Iroquois told the Huron that they drank his blood and ate his flesh so that they could be as strong as the priest had been. “The Native Americans were incredibly superstitious, and a spiritual solution would be a reason to condone nearly any sort of behavior. Many of a tribe’s decisions were made only after supernatural omens or dreams were consulted, which clearly demonstrates that spiritual influences had deep effects in the Indian psyche. Supernatural meaning in dreams played an especially large role in Iroquois life, often to the point that something received in a dream could be bestowed upon the dreamer in reality, or an action performed while dreaming would be reenacted by the entire tribe. “The same supernatural forces imbued shamans with great powers and influence beyond even the chief’s authority. The Iroquois even had a purpose for tobacco smoking—the pungent smoke was supposed to be an offering to the spirits of the dead. A belief system with this kind of spiritual emphasis in its make-up could easily condone cannibalistic practices. “There is also a question as to why the same cannibalistic practices were not performed on members of the same tribe. If it did indeed occur, then it was very rare or very private, since no accounts have been found telling of this occurrence. By the previous solution, dead members of one’s own tribe should have been the first ones to be eaten. The confederation system itself is perhaps the solution; instead of fighting amongst other ‘nations’ for the rights to the dead body, it was more productive to let it be buried. “Perhaps the more likely solution to this snag is that the Iroquois could not bear to eat one of their own tribesmen. Since the grieving process upset the Iroquois so much, they were probably unable to bring themselves to cannibalize their own “flesh and blood”. This also places emphasis on the “replacement” act of the ‘mourning wars’, rather than “recycling”. “Eating one’s enemies in order to regain lost power has a very broad appeal that also accounts for cannibalism in other northeastern Indian nations. Nearly all of the tribes in this area descend from the Iroquoia people and many of the primitive beliefs, like their shared language, would also have been passed on to the presently-developed tribes. “There has been no more intellectual nation among the aborigines of America than the Senecas of Western New York — the most original and determined of the confederated Iroquois — but its warriors were cruel like the others, and their squaws often assisted the men in torturing their captives.